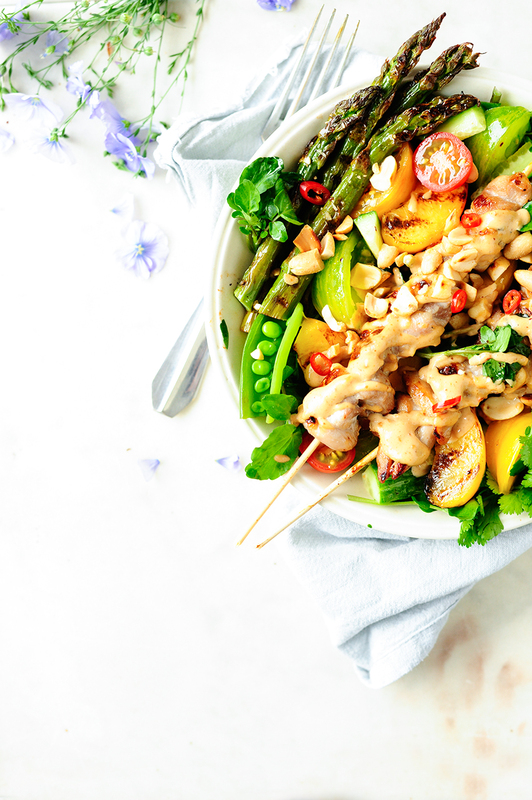 The summer season is coming, so I think we all might be in need for something on the healthier and lighter side, like this salad with lots of vegetables, grilled nectarines, chicken and peanut butter sauce. This salad is amazing, it is simple but at the same time it’s kind of unusual too. I love the combo of sweet nectarines with grilled chicken and crunchy peanuts. And if you’re thinking the nectarines are a strange addition with the peanut butter, maybe, but I promise they are delicious! Combine all the ingredients for the marinade in a bowl. Cut the chicken into thin strips, put in a clean bowl and toss with 3/4 marinade. Place in the fridge. Cut the nectarines into small pieces and toss with the rest of the marinade. Heat the coconut oil in a small saucepan, sauté the garlic and the ginger over low heat. Add the chili pepper and stir, pour coconut milk and bring to a boil. Combine with the rest of the ingredients and cook over low heat until the peanut butter has melted and the sauce is smooth. Season with salt and pepper. Cook the sugar snaps in salted water. Cut the tomatoes and the cucumber into small pieces. Preheat your grill pan to high heat. Rinse the asparagus under cool water and remove the woody stems. Drizzle with oil and grill for 10 minutes until soft. Grill the nectarines for 2-3 minutes or until light char marks appear, flip and grill another 2-3 minutes. Thread your chicken onto the skewers. Grill until the chicken is cooked through and light grill marks appear, turn from time to time so the meat doesn’t burn. Arrange the watercress on the plates, add cucumber, tomatoes and sugar snaps. Add the grilled asparagus and nectarines and top with the chicken. Drizzle generously with peanut sauce, add the chopped peanuts, chili pepper and fresh cilantro. Enjoy! fruit with hearty dishes is the most delicious combo!! Have a nice day, Heather!